Your target reader loves checklists because they distill the essence of what someone else (you, the expert) have painstakingly identified as being important for a particular problem. An article title that includes keywords relating to the type of checklist you’re creating plus the word “checklist”. (1) or (2) paragraph opening that explains what and why the checklist exists. The actual checklist of items. A conclusion that encourages the reader to pay close attention to the benefits of the checklist as you’ve just described. Mistakes in this template to avoid: Failing to make your checklist into a checklist. Don’t ramble on and on and on without using brackets [ ], bullet points and/or a numbered list. Your checklist should be fast and easy to read including delivering on the promise you made in your article title about a checklist actually being included in your article. (2) Important Article Title Tips: Avoid starting your article title with a conjunction or junk words such as “An” or “A” or “The” and roll right into the keyword relating to your expertise and your checklist. In addition, don’t make a 2 or 3 word checklist title! 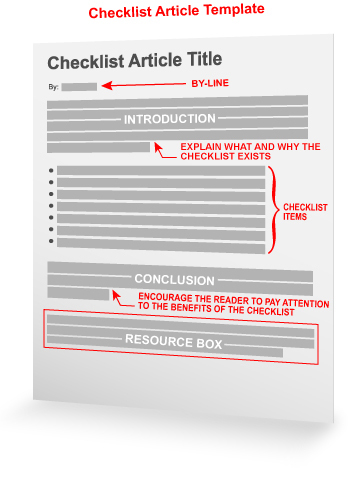 Instead, make sure your checklist article title is at least 5-9 words that further explains the benefit of what’s included in your article checklist. Now, go write your next original article as a checklist that helps your reader save time while you’re positioned as an expert in your niche. Great article. I’ve quoted you and put in a link to our content building website, which is not online, but is a place where our employees can develop content for our new and improved web site. Your tips for developing checklist articles is right in line with our idea for posting a series of “call to action” statements on the home page, with links to more details (bullets and numbers) about critical things to know when designing wireless networks. very good article. I am using it already to design checklist articles for online freelancing and home business evaluation. This is an interesting variation. I never write that kind of article, but this template can be used in all fields. Thank you for the suggestion and inspiration! Great wake up call as I sat at my computer trying to think of fresh content ideas. Finally a tip that applies to all niches. My next article, 11 most common car questions asked by new drivers! I think this is a great idea. My articles are mostly about learning music or concepts of music as perhaps applied to the guitar or music theory. I’m wondering how that could integrate into a learning article? A novel idea, keep it simple and organized. checklists are like “chunking” information. I am working on how to include them into my teaching of business ideas for me and other interested people. Used to prevent writers block for blog posts and article writing. You’ve caught the essence of checklisting. However, this is far from the whole story on how to write good articles. Many times a writer will hold himself or herself out as an expert and then crank out checklists that are far less than credible. If you want to be taken seriously, you have to support your assertions with good rhetoric — believable facts, statistics, logical reasons, and the like. You need enough discourse to fully engage the reader and bring them forward with you. And your list items have to be absolutely lucid and understandable. One slip and you’re toast. It’s simply not enough to crank out trite lists. If you want to build reputation, what you say must be relevant, practical, and credible. The internet is crawling with wannabe gurus all trying to get rich quick. And they’re all writing to people who think as they do. How many fortunes have been built on collections of tips? You have to be different by making a big promise and then delivering on it. By giving someone the steering wheel instead of just the road map. Don’t fall prey to this trap — believing that your readers are dumb enough to think they can conquer the world if they can manage to surf fast and compile enough shallow tips. The 5 best of this and the 11 worst of that, plus the 15 big mistakes, and so on. We’re getting sick of this. At some point, we need to transition from knowledge to wisdom. To connect the dots. This takes greater depth, and longer prose. People read long copy when it’s good copy. Sure, it’s great to have a few quickie lists but these are like tidbits. Eventually, the hungry want banquets. Tip lists are just the soup and dinner mints. Don’t forget to go deep and share something truly valuable — the background principles from which tips arise — in some of your articles. Maybe in most. Otherwise you’ll build a brand as someone shallow who deals only in trivia. So far my longer articles are doing just fine. Getting page hits and publications. My site traffic is steadily rising. And I haven’t sent out any tip lists. So, here’s my idea for a tip list article: “Beyond Tips and Trivia: 15 reasons why you need true depth in your articles.” Coming soon. I agree, it’s not the knowledge, it is the real experience. I must admit that I am still “surprised” to say the least about the content of many articles I see. And about the copy on the web in general. Especially about “Earning money in minutes” etc. Regarding using “tip-articles” and articles to build you business. I have created a simple tool called “tiparticlecreator” including google and amazon and a tell-your-friend function. And that works prety well. In any case it forces people to structure their thoughts and think. That’s also the way of course you would start writing in general. I don’t think a well thought out list contradicts good content. It is a way of organizing your thoughts, material, and content. It is a way of neatly presenting the meat of the article. A checklist is more appropriate for some set of actions you are asking your reader to take. As to fortunes made on tips, well, maybe ask the FlyLady. Providing quick and useful information is refreshing. So many times I have read articles that drone on and on not REALLY adding value. Because I have a short attention span, checklists are easier for me to read and absorb. Great idea! I think I have some work to do now…. When I was at Nolo Press we used checklists within our self help legal books all the time. The reason is that most people want to be able to accomplish a task in bite size chunks. Lists are the ultimate “chunking tool”. And people also like to check off or cross off the step tasks as they do them which provides a nice physical sense of accomplishment. Procrastination is the enemy when it comes to goal achievement and the humble step by step checklist is the simple tool to keep moving forward until completion. I agree with Tom. Checklists make the process of grasping and implementing a solution faster and easier for your readers. I am a huge fan of checklists and share them often with my clients. And of course most of us start our days with a to do checklist – we’re familiar and comfortable with them as a way of tracking our successes/our accomplishments. Also if you are an educator or trainer, sometimes you thing in terms of checklists—how something is done, what has to be included for a successful outcome– so this template would be a great guide for getting that information out of your head and out into the world. The goal of my articles is to teach and hopefully to spur people into action. Checklists and simple how to lists, help me do just that. About an hour before reading your “checklist” invitation, I wrot a guide for video SEO for stock trading website marketers. Well, I changed the title from guide to checklist and did some rewriting of the content, as you suggested, and think your suggestions made my article much more effective with more power for the reader, I suspect. I’ve submitted a couple of articles already but my structure was poor. Thank you very much for these templates. I’ll be using these to write all my articles from now on. That is a great tip psrticularly too those new tto the blogosphere. Simplle but very precise information… Many thanks for sharing tgis one.